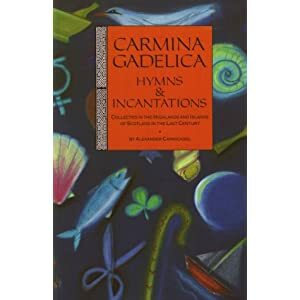 A few years ago, I attempted to read Carmina Gadelica by Alexander Carmichael. It’s freely available on Sacred Texts if you’re ever interested. I think I didn’t get far because I find it difficult to read anything lengthy on a computer screen. I read the introduction. I remember nearly crying when I read about the destruction Celtic culture faced in the Scottish Highlands. There’s a story about a fiddler and his violin which had been made by one of Stradivarius’ students. The poor old man sold it for a paltry sum to save the instrument from the mass burnings. Harps, fiddles, drums… The people were scared to tell the old stories or prayers to Carmichael for fear of punishment from local authorities. I recently started to read the collection again – only with a paperback this time. I reread the introduction and felt the same sadness and anger. Humans can be so cruel to one another. I have not finished the text but have read a decent chunk. As always, I’m amazed by the way Christianity and Paganism have been braided together. One might find it a labor to read because of how very Biblical it seems with its many Christian references. I find it fascinating. There is still so much to learn about the culture and their beliefs even when the magic is thinly veiled. While it is true that this work has been edited by Carmichael and his grandson (I believe), there is much to glean. For example, I don’t remember reading or hearing descriptions of Brighid before. Of course the people Carmichael spoke with referred to her as a saint and her myth had evolved since Pagan times… But her character was intact. Anyway, I’m so used to Brighid as a red head. Other Pagans see and illustrate her that way. I see her with red hair in my mind’s eye. These Scottish prayers, however, refer to her as having blond hair. Sometimes it is gold, platinum, or a dirty blond. It made me recall the many Irish legends where the ideal beauties had blond hair. It’s funny how everyone associates Celts with red hair… I’m not sure if these Scottish prayers will alter the way I see Brighid. I haven’t sought her in trance recently. Not that her appearance matters too much. Her symbols are cattle, fire, healing wells… Perhaps it is different for Gods who have symbolic feature such as Balor’s famous eye or the Norse Sif’s golden hair. The corporeal trappings we give deities (or do they give them to us?) seem more for our comfort and comprehension than anything. The mythology of Brighid, and her transformation from Goddess, to nun, to saint, speak volumes on the greater value of personality and values over appearance. And yet, perhaps her hair is another symbol? The flicker from red, to white, to gold is the dancing flame. Just as with cloud gazing, each person who gazes into Brighid’s spirit sees a different shape in the flame… What do you see? I love it too! One of my favourite resources for Scots lore. So much of it is just so darn magically practical! If you’re reading the abridged version, you might still want to pop into the online version now and then as it has all the notes, stories, and anecdotes between verses and it’s really the notes at the end of each volume of the Carmina Gadelica that make it so awesome. There are actually six volumes, but Carmichael died before being able to edit them all. His grandson and another fellow finished them from the 1940s-70s. I’m still trying to get my hands on the other volumes so I don’t know if they are awesome or can add anything to a Pagan’s practice yet. Books I’ve found that pair well with it to help one discover how to put the prayers and chants to use are The Gaelic Otherworld and Singing With Blackbirds. Indispensable if you follow a British Isles-based path!